Earn up to 1,112 reward points. Designed by guitarist Gary Hoey to deliver amazing distortion tones with tons of sustain. "I'm so proud to have designed this with Rocktron and to make a distortion pedal that will give you the sustain to make your leads sing, and also give you the clarity to cut though the band or mix." - Gary Hoey. 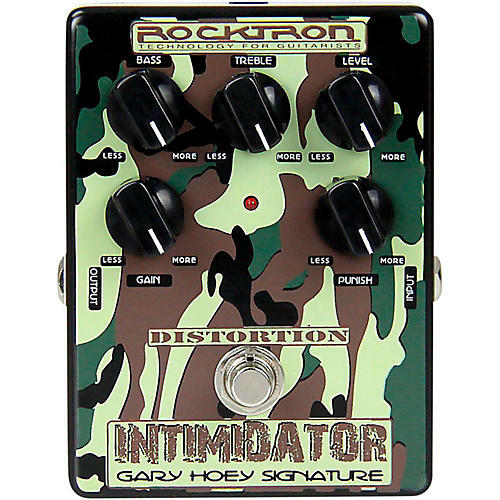 Rocktron has producued many pedals in its day, but nothing quite like Gary's Intimidator. From his choice of a camo look, to the internal components that deliver the goods, this pedal belongs on your pedal board. Control knobs include LEVEL, which controls the ouput volume, BASS to control the bass level and TREBLE to control the treble level settings. GAIN controls the amount of gain and PUNISH controls the distortion waveform symmetry and definition. The footswitch controls On/Off status (indicated by the LED). Gary writes that "the Intimidator is a very powerful distortion, so start with the gain and level below half way and bring up to taste. The treble control is "bright" depending on the amp you use. If you use a clean amp then you will add more gain, and less treble, and for a high gain amp you will need less gain." Explaining the PUNISH control, Gary states, "the PUNISH control can add a nice mid range thickness and round out the sound. Make sure you bend down and listen to what's coming out of the speaker to hear what your audience is hearing. Also try some of my setting that I've included in this manual." The included instruction manual shows various settings such as "Blues Low Gain Amp", "Metal Rules High Gain Amp", "Gary Hoey Favorite Main Lead" and more. The Gary Hoey Intimidator can be powered with a 9V Alkaline battery. To save on batteries, The Intimidator Distortion pedal can also be used with the Rocktron DC OnTap Universal Power Supply (sold separately). The Rocktron DC OnTap provides constant flow of power to the pedal, unlike a battery that can degrade over time. Dimensions: 95mm x 122mm x 56mm, 3.75" x 4.75" x 2.25"